Programmable Logic Controller or PLC has become an indispensable part of small, medium and large control systems. In its smallest configuration, it replaces a relay logic controlling the sequence of operations of a small machine tool. In its large configuration, it performs various analog and digital control functions in conjunction with several other PLCs in a large distributed control system. Installation, programming and operation of a PLC controlled process or machine is a skill of a modern operator or technician should acquire. Similarly a machine tool/process engineer while planning or operating such a machine tool/process should have working knowledge of the same. Retro fitment of PLC’s replacing old relay panels is also vital area knowledge of PLC which will enable a shop floor supervisor to recommend significant improvement of reliability and performance of his production unit. Training on PLC is our main forte. The course aims at equipping the participants with the requisite knowledge and skill to translate any simple logic control requirement into PLC language and program a PLC to accomplish the task. It will also help a participant to install a PLC and conduct basic troubleshooting. 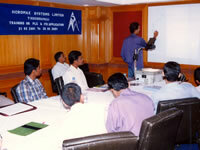 This course is focused in imparting knowledge of Real time Distributed Control System. Hands on experience will be made available on programming, Loop Configuring, tag configuring, Generation of Mimics, Display Configuration, Logging and simulation of DCS with real time applications. The objective of this course is to impart the importance and basics of Field instrumentation, types of field instruments, measurement techniques, symbolic representation of Field importance, and erection & commissioning of field importance. The objective of this course is to impart the importance of detailed engineering in a particular process. The various objectives required in complete engineering of process will be explained in detail extending to the design parameters of primary sensing elements, sensors and final control elements. The course aims at equipping the participants with the requisite knowledge in detailed engineering with skills in knowing the integrities of the process.